YOU ARE HERE:Home » Betterment » Betterment Review 2019 – Should I Sign Up for Betterment? The Betterment robo-advisor checks all the boxes. I was a podcast guest several years ago and asked the host if she used a robo-advisor to manage her investing. She disclosed that she invested with Betterment. Curious, I looked into Betterment, and discovered a treasure trove of features to help both the novice and advanced investor manage her portfolio for a low fee. I decided to invest with Betterment myself. You may have heard of Betterment. 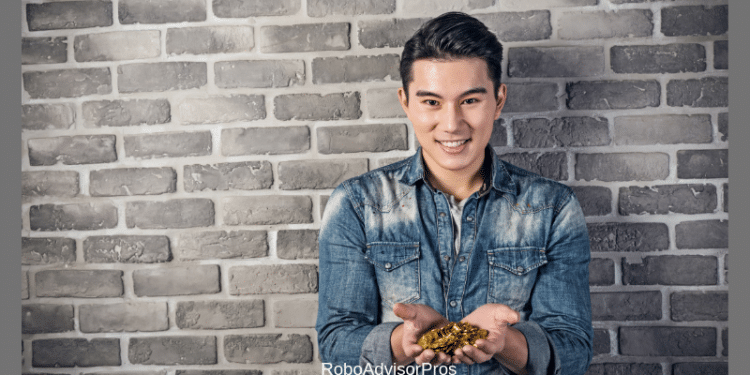 It’s one of the original robo-advisors and still considered one of the most innovative. You’ve probably seen a lot of Betterment reviews. This Betterment review is for you if you’re looking for the most comprehensive exploration of the Betterment robo-advisor, without actually signing up. This Betterment Review lays out all the information you need to make an educated decision about whether to sign up for Betterment or not. As a former portfolio manager and university investing instructor, I go beyond the surface to provide an honest appraisal of the advantages and disadvantages of the Betterment robo-advisor and arm you with the information to answer the question: “Should I sign up for Betterment? Should I Sign up for Betterment? What Happens When You Transfer Money Into the Betterment Platform? How Safe is Your Money at Betterment? Betterment, launched in 2010 and is one of the earliest digital investment managers, created to compete with human financial advisors. For the newbie, a robo-advisor uses computer algorithms to manage your investments. Betterment provides a simple, well-supported, low cost strategy to invest your money in line with financial best practices. Betterment manages approximately $16 billion, as of February 19, 2019, and is the largest independent robo-advisor as ranked by assets under management (AUM). Betterment Digital offers online computerized investment advice. For investors seeking personalized human guidance, Betterment Premium includes access to financial advisors. And, if you’re seeking occasional financial advisor help, they provide several a la carte financial advisory packages. The Betterment platform strives to maximize your investment returns at every risk level. That means, if you’re a conservative investor, the Betterment robo-advisor will give you the opportunity for the highest returns with the least amount of risk. Overview Goals-based digital investment manager with access to financial advisors. Minimum Investment Amount No minimum. No fees above $2 million. Top Features Digital and hybrid investment management (with financial advisor access) options. All investors can text with financial advisors. SRI, income + smart beta portfolios available. Free Services No management fee for assets over $2,000,000. Free portfolio review. Contact & Investing Advice Phone + email support 7 days per week. Investment Funds Low fee exchange traded funds from diverse asset classes. Accounts Available Single + joint taxable brokerage. Roth, traditional, rollover + SEP IRA. Trust. Promotions Free account management special promotion. * The highest returns for the lowest fees. * An investment approach that is supported by “years of research and Nobel Prize-winning Modern Portfolio Theory”. * An investment approach that minimizes taxes. * A guide that indicates whether you’re on track to meet your financial goals. * A platform which chooses funds with the best risk-adjusted returns for the lowest fees. * An opportunity to select a socially responsible portfolio that aligns with your values, uses a smart beta strategy or provides an income stream in retirement. * Access to human financial advisors. This may be the one universal trait of all robo-advisors. When you first sign up, you answer a few questions about your investment goals and risk level. Based upon your answers, your given a tentative list of investments in certain proportions. This is called your asset allocation. The asset allocation remains constant, until your situation changes or until you decide to change it. Typically, younger investors own more stock funds and a smaller percentage of bond funds. And, older or more conservative investors own greater percentages of bonds and lesser amounts of stocks. Betterment periodically reviews your investment percentages in each category and rebalances, or sell those funds that have surpassed your allocated amount and buys more of those that have lagged your desired percentage. Rebalancing helps temper the ups and downs of your investment values. Betterment focuses on keeping taxes low, in both taxable and retirement accounts. They place assets in accounts that will minimize tax payments. Betterment offers tax-loss harvesting for taxable accounts. When an investment loses value, Betterment might sell it to offset the increase in taxes from investment gains. Betterment states that this strategy could increase returns by 0.77% per year. 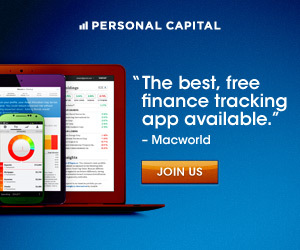 Click now to sign up for Betterment! * Am I saving enough for retirement? * When can I retire? * What will my retirement look like if I don’t boost my savings? * What are the financial implications of moving to a different place for retirement? * Are there better ways to invest for retirement? This powerful retirement planning tool combines advice with tactics to save and invest for retirement. Anyone can use the Retirement Savings Calculator, even those who don’t invest with Betterment. The Retirement Savings Calculator looks at all of your accounts, even if they’re not invested with Betterment, to give you a specific retirement blueprint. This impressive tool sets Betterment apart from many of its competitors who don’t consider the investor’s total asset picture. The Retirement Savings Calculator delves into your personal situation, incorporates 20 inputs, and figures out how much you’ll need to have in order to meet your individual retirement spending goals. Then the guide tells you exactly how much you’ll need to save and in which accounts in order to reach your retirement plan. 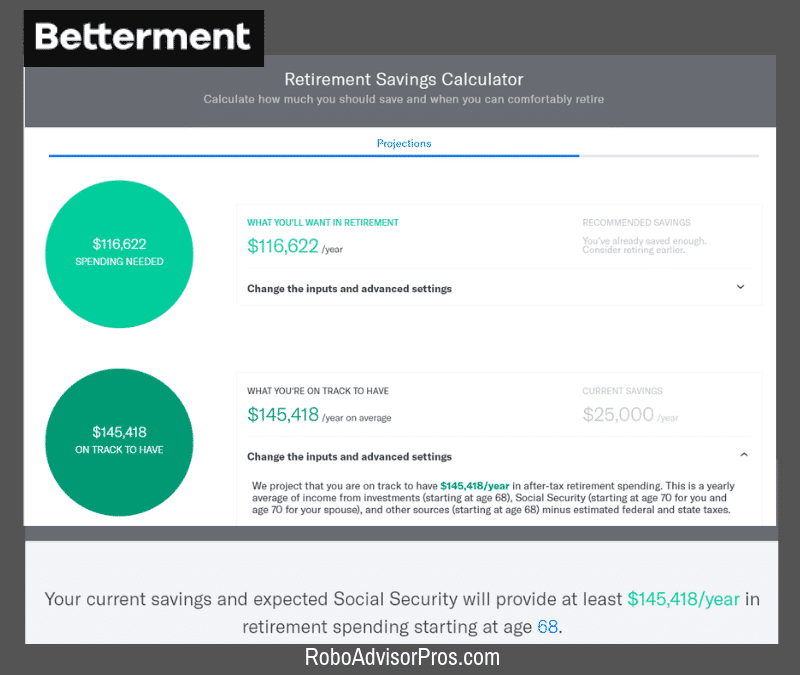 The Betterment Retirement Savings Calculator eliminates the fear that you’ll outlive your money, with future projections based on your financial situation. * Socially Responsible Investors – The SRI portfolios allow you to invest with your values and choose to put your money in socially responsible firms. * Goldman Sachs Smart Beta Portfolios – This approach is good for investors who want to attempt to beat the market and are willing to take on a bit higher risk. * BlackRock Target Income Portfolios – These bond portfolios are designed for conservative investors seeking cash flow. These three new investment portfolios can be selected in addition to or instead of your traditional Betterment goal-based portfolio. Bonus; Betterment Smart Saver is awesome for emergency fund and cash management. The Betterment sign up is fast and easy. Answer these questions, and you’ll be up and running in a few minutes. First, list your age, whether you’re retired or not and your annual income. Notice that to the left of each goal, there’s a circle with the percent of recommended stock funds vs bond funds. That’s your asset allocation! The percentages are adjusted based on your age, income and whether you’re retired or not. 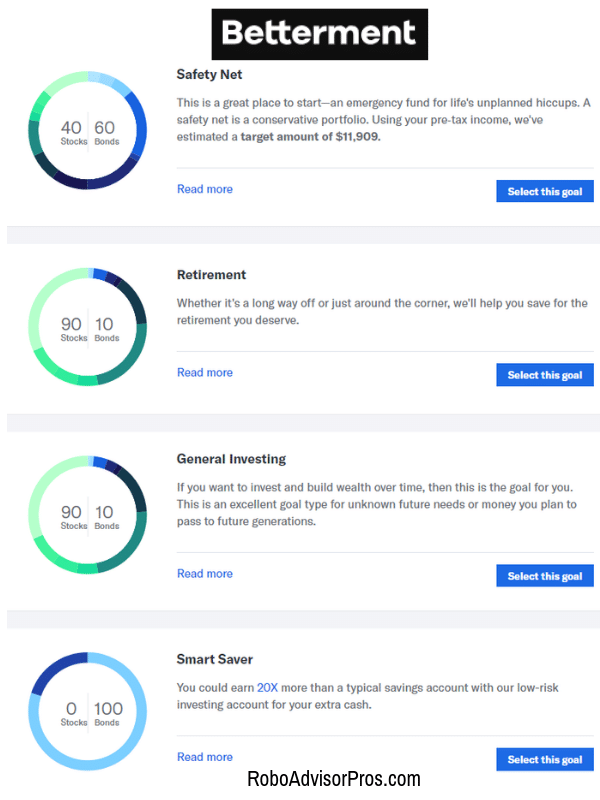 If you’re not sure what type of account to open, Betterment offers a brief description of each type. Finally, you get a “sample” list of investments in percentages that correspond with your investment goal, age, income and whether you’re retired or not. You can change any of these percentages when you actually open your account and begin investing. A sample portfolio for a 38 year old with an annual income of $70,000, saving for retirement in an individual taxable account was recommended a 90% stock and 10% bond investment portfolio. The investment percentages will change according to your goals, age, retirement status and account type. And, you can always adjust the investment percentages based on your preferences. After that, you provide your email, and if interested, begin setting up an account. You won’t start investing until you actually transfer money into the account. Your work is done, and Betterment does the rest. Your funds are transferred into ‘Betterment Securities’ a regulated investment broker-dealer. The ETFs are bought for your account based upon your previously selected broad asset class categories; stock and bond funds. Betterment takes care of all of the buying and selling for you. The fund choices are well diversified globally. You may change your asset allocation choice at any time. We particularly like robo investing because, when left to your own devices, it’s easy to get waylaid by fear, greed and other emotions. These behavioral biases can cause you to make poor choices; selling as fund values fall and buying after a run up in price. By investing with Betterment, you have a barrier to keep you from making poor choices during market transitions. Bonus; M1 Finance VS. Betterment – Which Robo-Advisor is Best For Me? Betterment requires no minimum investment amount and has a simple, two-prong fee system. With the Betterment Digital plan, the fee is 0.25% (AUM) on all money invested up to $2,000,000 with 0.15% fees above that amount. This plan requires no investment minimum amount. You get all the standard Betterment features including texting access to financial advisors. * Personalized financial advice including how much to invest and in what types of funds. * Low-cost, globally diversified investment portfolios. Your portfolio is designed to maximize your returns at every risk level. * Automatic rebalancing, back to your preferred percentages invested in each fund. * Tax-loss harvesting strategies for taxable accounts. * Holistic view of all of your accounts, even those outside of Betterment. * Access to licensed financial experts via the smart phone app texting feature with expected response within a day. Betterment Premium requires a $100,000 minimum investment account and charges 0.40% of AUM. Fees are reduced at the $2,000,000 AUM. That means assets above $2,000,000 are reduced to 0.30%. * Human financial advice on all investments, within and outside of Betterment accounts. That includes managing 401(k)s, real estate, stocks and more. * Unlimited access to CFP® credentialed financial advisors for all life planning decisions that impact your money; retirement, having a child, getting married and more. Betterment recently launched five specialized advice packages. The programs are designed for specific investor’s goals. The Getting Started package is great for newbies who want a quick assessment of their account. The Financial Checkup package is designed for a thorough investment portfolio review. The College Planning package is for parents who want help navigating the college planning (and payment) process. And the two remaining packages, marriage planning and retirement planning are as their names suggest. * The one-time fees for these add-ons range from $199 to$299. There is an additional layer of fees, which is always charged by an exchange-traded or mutual fund, at Betterment or anywhere else. Your money is invested in up to 13 diversified exchange traded mutual funds and each one has its own rock-bottom management fee ranging from .09% to .17%. This equates to a fund management average of approximately 15 cents for every $100 you invest. Safety means many things. There’s safety from fraud and malfeasance, and then there’s safety from price swings. Since Betterment is a registered investment advisor (RIA), your money is governed by the laws of the Securities and Exchange Commission as well as the Financial Industry Regulatory Authority (FINRA). Your money is as safe as it would be in any other regulated investment account. Additionally, the platform has bank-level encryption service and is as safe as your online bank. If you’re looking for safety from price swings, that’s a different type of safety. All financial assets will go up and down in price. That’s the price you pay for an opportunity for greater long-term returns. Only bank money market accounts and certificates of deposits lack up and down price swings. But those types of investments don’t offer much long-term growth potential. For emergency cash or short term needs, the Smart Saver option will keep your cash relatively free from major price swings. There’s debate surrounding whether more or fewer funds are best. My belief is that as long as your investment portfolio invests in U.S. and international stocks, several types of bonds then your investments are sufficiently diversified. If you own at least four funds from the previous categories, you’ll have sufficient diversification, any more is personal preference. The first ticker represents the main fund. The remaining are used for tax-loss harvesting to avoid the wash sale rule. I like the stock and bond fund choices offered by Betterment and actually own several in my investment portfolio (VTI, VBR, and VWO). Betterment’s decision to include “value” funds is based on research that has shown value stocks outperform the market over long periods of time (although not always). The variety of international and municipal bonds are also good selections for extra diversification. One of the things we like are the Betterment fees. They are among the lowest of all of the robo-advisors, with low advisory and fund management fees. To further support the Betterment fee structure, there is extensive research demonstrating that lower fees lead to greater returns because more of your money is going into the investment markets and less is taken out in administration costs. The Betterment strategy takes the guesswork out of investing. It is based on the Nobel Prize winning modern portfolio theory which maximizes your returns, for any risk level. In other words, after you choose your asset allocation, you get the best returns for the lowest volatility. There are no account minimums, which makes Betterment perfect for the investing beginner. But even experienced investors with large portfolios will benefit from the researched-based investing method along with the low fees. The Retirement Savings Calculator takes most of the guesswork out of retirement planning and ensures confidence that you’ll have the money you need for the retirement you want. And, you can use it without signing up for Betterment. Betterment optimizes the bond mix for tax-deferred and taxable accounts. In simple language, this means, they work to reduce the taxes you pay on investment income and capital gains, allowing you to keep more of your investment returns. The automated tax-loss harvesting further minimizes taxes and increases overall returns. Betterment claims their tax loss harvesting strategy beats other advisors by about 1 percent. The access to financial advisors is an affordable way to get human financial advice for a reasonable fee. The a la carte financial planning packages are superb for help with specific goals. Betterments new smart beta and socially responsible funds make this robo-advisor even more attractive to invvestors seeking to invest with their values or try a different strategy. The smart saver option is an important addition for investors with short term goals that can’t tolerate much volatility in their investment values. If you happen to be a financial planner, Betterment for Advisors is an ideal solution to streamline your back office and set up an automated investment platform for your clients. For investors looking to buy individual stocks, this isn’t the platform for you. Betterment doesn’t offer real estate investment trusts (REITs) or other sector funds. They claim their investments are sufficiently diversified. We like the option to invest in real estate for diversification. Finally, if you already have an existing IRA or brokerage account, you need to liquidate the holdings before transferring the cash into Betterment. According to Betterment, although you may incur tax consequences from selling assets in a non-retirement account, the benefits of investing with Betterment should make up for those losses. The sound portfolio theory, low fees, and good fund choices make this almost the perfect investment platform. The addition of financial advisory access for a reasonable fee, smart beta and SRI portfolios is great. Although other online Betterment reviews suggest this platform might be best for lower net worth investors, we disagree. Any investor seeking low-fee, well-researched investment management should check out Betterment. If you have existing assets in a taxable brokerage account, make sure to investigate the tax implications of switching to Betterment. One Betterment drawback is its asset allocation assumptions, they might slant towards the aggressive side. We suggest that you look for an online risk tolerance quiz to help you decide the percent invested in stock versus bond funds. Fortunately, you can adjust your asset allocation to suit your preferences. Even when I was younger, I wasn’t comfortable with allocating more than 60% of my assets into stock investments. That said, Betterment’s ease of use, no minimum, sound investment choices, tax loss harvesting, goal-based objectives make this a good choice for an investor who isn’t interested in managing their own investments. 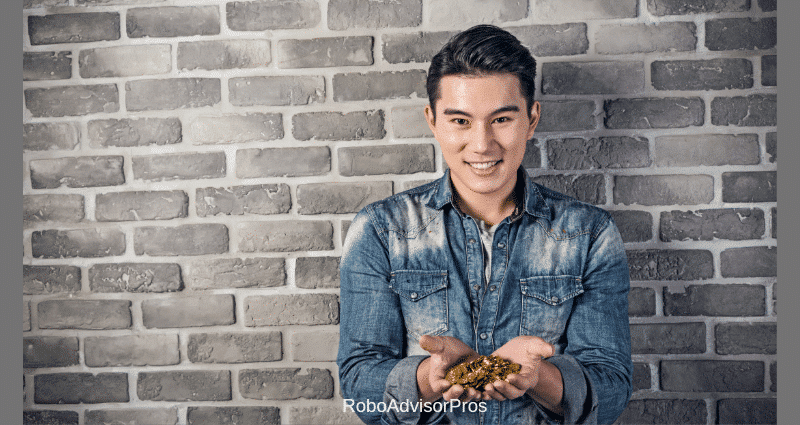 A main advantage of Betterment – and robo-advisors in general – is that digital investment platforms give the investor built in discipline so that fear or greed won’t cause you to buy high and sell low. Disclosure: I have an account with Betterment.